This is my completed contest entry, you’ll find the former starting post at post #2 and the build progress in the following posts. - or an illumination for rooms without mains current. I can dim this light steplessly, select a couple of strobes and set the sleep timer with my android app. And I’m able to do some basic programming with the app, for instance the number and output of modes which are selectable with the reverse clicky at the light, and the parameters for low voltage shutoff and temperature protection. The light also talks back – temperature, cell voltage, the remaining time of the sleep timer and the current output level are displayed in the app, even when its on standby. Its also possible to use this light without bluetooth: bluetooth is activated after a full power cycle, and if my app does not connect within 30 secondes with a valid command, bluetooth is powered off. The transmission is password protected and crc secured, only my device is allowed to control the light. Its 3d printed with a copper disk inside for heat dissipation. I used 3 materials: green ABS mostly for parts contacting hot surfaces (withstands up to 100 °C), PETG (up to 70 °C) and PLA for the white reflector. It has 3 main LEDs (beautiful tinted SST-20 3000K), a RGB status LED, a reverse clicky for manual mode selection, 6 neodyme magnets in the botttom plate. I designed a new driver for this light, made a new firmware from the scratch and an android app for remote control. Its a 3 channel driver, with 1× 7135 for lower modes, another 5× 7135 for higher modes, and an additional resistor for a low output power saving mode (the MCU is sleeping in this mode, no PWM). The driver uses the memory decay method to detect short clicks, so no port is wasted for this. There isn’t any port free anyway: the Attiny85 has 5 ports (if you keep the reset pin free for programming) and they are used for: the 3 channels, bluetooth module enable and bluetooth data transmission. the light can be charged with the integrated USB connector. This allows to use it as an always fully charged backup light. - Bluetooth standby time: more than 2 months. This light works as expected. Heat dissipation through the copper disk is more than sufficient, telemetry shows a maximum of about 65 °C when running on full power (at room temperature). You can feel the heat at the protruding copper, you wouldn’t like to touch it for more than a few seconds. The plastic housing gets only slightly warm, also the cells inside. When temperature protection kicks in it cools down fast. This is with the less effective SST-20, with more efficient LEDs like XP-L it should stay even cooler. Bluetooth remote control works flawlessly, tested up to a distance of 15 m.
The 6 neodyme magnets are pretty strong but the plastic of the bottom plate is somewhat slippery. So on a very smooth metal surface it might slide downwards. I may address this issue probably with 3 countersunk rubber feet which protrude a fraction of a millimeter. This will also help standing firmly on uneven desks. Ok, let me just throw my hat into the ring for the first time. Don’t know yet if this is a good idea since it’s pretty uncertain whether I’ll finish this project at all – perhaps because it’s not feasible due to the limited tools I own, because of lack of time or money or just because of missing skills. Two events happened in the near past: I’ve been camping with wife and kids (first time after decades) – and I got my first 3d printer. During camping I missed a lantern which I could place on the camping table, e. g. for reading or playing games. I don’t like the common camping lights since they are still too bright in the center which causes dazzling, I’m pretty sensitive to that. Whenever possible I prefer indirect lighting. I did some rough tests with my Q8 and some ugly parts printed with my new 3d printer and the result turned out pretty well. So the following project idea grew in my mind. This sketches are pretty rough, quickly created with Tinkercad. Lots of details are still missing. - 3 white LEDs and 3 red or orange LEDs arranged in a circle, pointing to the retractable reflection shield on top of the light. Casing will be 3d printed, so I’m joining the machined category, I guess. There is a copper or aluminium disk in the middle of the casing which protrudes a couple of millimeters to help spread the heat – which is hopefully not too much since this light will not be driven hard. As white LEDs I intend to use 3 of the beautiful Nichia 219B out of my hopefully soon arriving ROT66 (I have a special idea for the ROT66 where I don’t need all of these LEDs). Don’t know yet if I finally add the 3 color LEDs but I think it will be nice to mix them with the white LEDs for a comfortable tint in the night or to simulate candle flicker. I could even use XM-L RGBW LEDs which enables me to add disco light (my son loves this idea). The casing will probably be made of ABS filament, since it’s more resistant to heat than PLA and can be sanded easily to achieve a smoother surface. Have seen the planned telescope system for the reflection shield in my selfie stick, hopefully I’ll get this working with my 3d printer as well. Mounting points are planned for top and bottom of the casing, in order to hang this lantern to the ceiling. If possible I’ll make the reflection shield removable in order to have the option of direct lighting when required. Don’t know yet if I’ll add magnets since I probably don’t have a usage case for them. The LED boards will be mounted to the metal disc, glued or soldered, don’t know yet. Still wondering if I’ll use reflectors (have a couple of spare S2+ reflectors left after triple mods) or optics. Probably narrow optics are better since I want as much light as possible to hit the reflection shield. They shall sit pretty deep in the casing, I don’t want to see direct light from the LEDs from the side. The reflection shield will probably be kind of a cone in order to spread the light around. Unfortunately it has – when 3d printed – steps which negate the intended purpose since their surface mostly has a right angle to the beam. I might sand this cone (or smoothen it with acetone) and cover it with reflection paint for better light distribution. If I find the time I might even design a fitting driver board, otherwise I’ll just use one of my existing ones. Finally I have another nice gimmick in my mind for this lantern which I’ll reveal later when I know for sure it will be realized. And don’t forget to PM =the= for your thread to be added to the contest! Nice idea! This will be a very unique lantern for table-top lighting! Here’s an idea: Do you really want to make everything 3D printed? You maybe could use a piece of aluminum to make the reflector cone. If you can find a thick enough piece of Aluminum plate or bushing/washer, you could drill a center hole (if using plate), put a bolt through, and spin it on a hand drill held down with clamps. Then file the cone shape with a hand file while it spins. After, maybe you could 3D print something to plug the hole that will also be the hanger for the top. Good luck Mike! What printer do you have? We are living in a flat, unfortunately without a dedicated room which is suitable for metal working. Neighbours won’t like me using machines here, and I won’t like the cuttings all over my room. Apart from that, I really like the idea to use as much 3d printed parts as possible, as a proof of concept. Btw., I don’t see an advantage in using aluminium for the reflection shield. I need diffuse reflection, just like the ceiling of my room, and the aluminium won’t be much better for this purpose, I guess. It mainly adds weight. Whether you finish in time or not to me doesn’t matter. I was looking at your pictures thinking they looked pretty good when I read they are pretty rough. I’d like to see your good sketches. All the best for the build and the surprise. Well, my thought was that you might want as much reflection as possible, even if (or especially if) it is diffuse. But I understand your limits on machine noise and dust/debris. It should work well enough with the reflective paint I think. I’m looking forward to seeing your build. You can heat shrink it tight on the cone for reflection. I used this Monokote when making RC Planes with my son yrs ago. Use a light heat gun to shrink it tight after super gluing it down around the edges. I have the same printer, indeed a nice and small device. What improvements did you do? Lately I installed a E3D V6 clone on mine together with a firmware upgrade to the latest marlin, have not printed a lot after the change but the few prints I did came out great. Also did some smaller upgrades like belt tensioners, filament guide and a tilted lcd mount. Do have to say that I kinda expected a little bit better print quality out of the box after seeing many reviews. But I do like this small machine! I have the same printer, indeed a nice and small device. What improvements did you do? Up to now only the simple ones, like filement guide, silent fans for board and hotend. Designed and printed a small plate for the bottom of the hot end to stop the fan blowing partly onto the printed object (when using ABS). Designed and printed a simple filament roll holder since the filement string had too much tension when pulled from the holder on top of the Z-Axis. Haven’t changed the power supply’s fan yet, since it was a too tight fit with the ordered silent 20mm fan (stock one is 15mm). Still looking for a fitting silent 60×60×15 fan with suffizient flow. Got the green ABS for the lantern yesterday, currently searching for the best slicer settings. Looks interesting. I considered making the cone of two parts anyway, so I could hide the glued foil around the edges with a flat plate on top. Unfortunately I haven’t done much for this build in the last days but I got more familiar with 3D design and printing. I created my first designs with Tinkercad which is great for beginners but lacks features for advanced designers. So I downloaded Fusion360 which is more capable. As in other products of this company I had my problems with the user interface but was able to create my first design after an evening (and after lots of grumbling and google search). 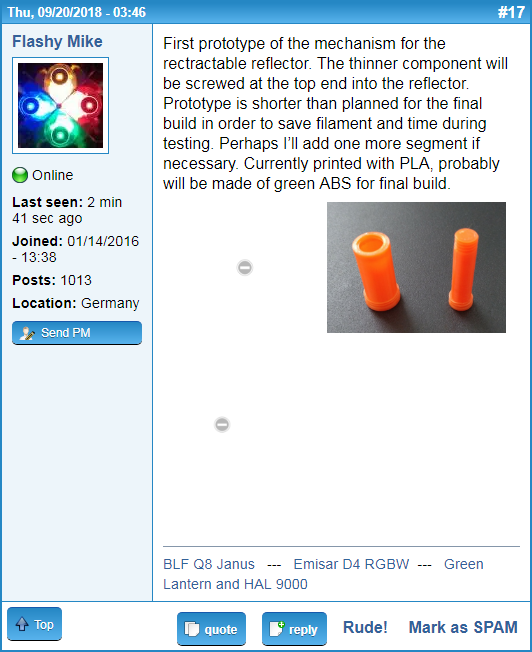 To learn more about the capabilities of my printer – and in order to know what I can do in my camping lantern design – I designed and printed a couple of screws and bolts in different sizes. Turned out surprisingly well, the smallest one in this picture is M3! First prototype of the mechanism for the rectractable reflector. The thinner component will be screwed at the top end into the reflector. Prototype is shorter than planned for the final build in order to save filament and time during testing. Perhaps I’ll add one more segment if necessary. Currently printed with PLA, probably will be made of green ABS for final build. Which of the pics can you see? There is a green rendering, and 2 fotos with orange parts, one of the fotos with 2 separate components. I’m using google fotos for this pics and there might be a problem with links. On my laptop I can see all the pics. Thanks! I guess I found the problem, all 3 pictures visible now after reload? Great ideas. One of these day’s I’ll get me a 3d printer. It’ll be fun watching what you can do with yours. One of these day’s I’ll get me a 3d printer. Its kind of zen watching the printer. A better approach for the retractable reflector, I guess. This one can lock at any height and only needs about a quarter turn for locking. The outmost tube represents the casing, so only the inner 2 tubes make the extendible part (for about 9 cm currently). The white dot in the center of the printed inner tube are the remaining threads of a printed M3 screw, made of PLA, which I broke during tests. Not unexpectedly, though. Made progress with design. The upper half of the casing, the retractable reflector and the bottom plate are almost finished and printable, the lower half of the casing still requires some work in the inside for the electronics compartment. Here are some new renders, size of this light is 10.2 cm in diameter with a height of 5.6 cm (closed). I consider this light a pretty compact camping lantern. I’ll probably use three SST-20 3000K LEDs. They should produce a nice warm illumination, so I discarded the idea of additional red LEDs. The LEDs sit in spare Convoy S2+ reflectors which I have lying around. The switch is a reverse clicky to avoid current drain, since this light might not be used most of the year. Driver will probably use 8 or 9 AMC 7135. The copper or aluminium plate in the middle of the lantern protrudes 3 mm, this allows a surface area of about 9 square centimeters exposed to the air. Hope this is sufficient cooling for 3 amps with this LEDs. If not I still can use less 7135. I’m still thinking about the charging modul. I would like to use USB-C but I haven’t found a reliable source. And I need a rubber cap for the cutout of this charging module, haven’t found any source yet. I don’t even know the proper english term for this component. This would work very well for charging the lantern, as it is more efficient that the TP4056, supports higher charging voltages, and would work with a USB-C female breakout board without any trouble since the current draw is predetermined. For a rubber gasket/O-ring, I do not know though. I’ll have to do more research on the subject.